When you choose Alarm.com, protection for your home is just the start. Our technology extends the meaning of security to protect more of the things that matter: your family, your safety, your time, your budget—even your deliveries. At CES this year, Alarm.com is introducing Wellcam™: the first smart home video solution designed to empower safer independent living. Wellcam is a state-of-the-art smart security camera, two-way communications device, activity sensor and more. It’s installed in your loved one’s home, but it’s also integrated with your own home’s security system and smartphone app. Wellcam makes it easier to stay connected to your loved one, and extends many of your home’s smart security safeguards to their house. If you’re one of the 35 million Americans who care for a family member aged over 50, Wellcam can help you. It’s an emergency safeguard and an early warning system. It’s also a fun way to say hello. 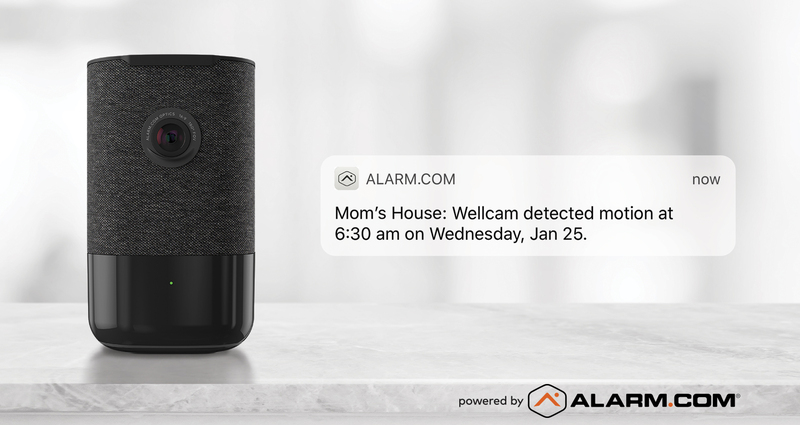 Adding Wellcam to your loved one’s home extends your own home’s blanket of Alarm.com protection and the peace of mind it brings. Check in with a two-way call: Wellcam’s call-out button lets your loved one easily initiate a hands-free call to your Alarm.com app without having to find or dial your number. When you want to contact them, a corresponding button in your app puts you straight through to Wellcam’s clear, high-quality speaker. Check in visually: Wellcam’s 180-degree camera, with 1080p resolution and 6mp zoom, can cover a wide area like a kitchen or living room in high definition. If you don’t have time to talk, but need to quickly verify that everything is okay, Wellcam makes it easy to check in in real time. If you’re using Wellcam to monitor a specific area of the home, like the hallway or front door area, video alerts can show you important activity as it happens. Stay in the know: While traditional independent living solutions like Personal Emergency Response Systems (PERS) are designed for emergencies, Wellcam—like our broader Wellness solution—helps you intervene before a problem becomes an emergency. As well as giving you a clear view of things, Wellcam is also an activity sensor for Alarm.com’s smart home platform, which learns activity patterns and alerts you when they change. By keeping you in the know with activity charts, daily highlights summaries and proactive alerts when things change, Alarm.com can keep you one step ahead of emerging quality-of-life issues so that you can take action. Want to know more about Alarm.com’s Wellness solutions? Our Wellness technology empowers smarter, safer independent living with a 24/7 safety net of proactive safeguards for your loved one, including new Wellness Insights enhancements that use predictive analytics to monitor quality of life, learn activity patterns and quickly detect changes in routines.